Werewolves? Check. The plague? Sure. Pagans selling their souls? Absolutely. 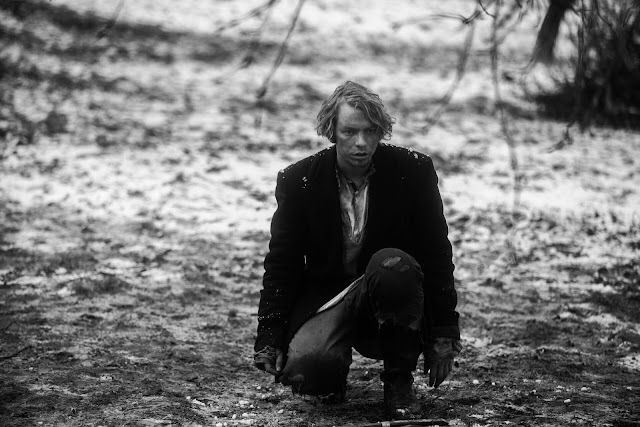 NOVEMBER is set in an Estonian village where the batshit crazy supernatural leanings of director Rainer Sarnet are allowed to run free. The film is essentially a twisted fairy tale about unrequited love or what a Lars Von Trier romantic comedy might look like. In NOVEMBER, the villagers' fundamental issue is how to survive the frosty, dull winter. Nothing in this bizarre universe is unthinkable. Individuals take from each other without regard, from their German house rulers, from spirits, from Satan, and Christ himself. The only moral compass is self-interest. A youthful farmgirl Liina (Rea Lest) is miserably infatuated with Hans (Jörgen Liik), a close-by farmhand, whose heart she loses to the little girl of the German estate master. Keeping in mind the end goal to recover his affection, Liina is willing to do whatever it takes, regardless of whether that implies taking advantage of the dark enchantment that is hovering around the town. The idea that everything has a spirit is the focal subject of the film—offering one's spirit, living without a spirit and aching for a spirit. The story blends Estonian tall tales with Christian folklore. In this story, Estonian fables have been dismantled and recreated so the darker and uglier side of human instinct is uncovered. A long way from being only a parody of materialism, the story touches something significantly more primordial. Using absurdity the film expresses a dark truth about humanity that is depressingly universal. The numb and quiet way that individuals steal without thought. NOVEMBER, despite its lush black and white photography and the eastern European setting, is not your typical art-house fair. The film's tall tale like dream components are juxtaposed with situations that are perfectly reasonable. This Venn diagram of aesthetic and narrative choices gives the film a striking balance that is both disturbing and insightful. In his forty-eight years of existence, RAINER SARNET has directed five films, lived with three women, accumulated about ten friends, passionately loved Fassbinder and directed theatre plays by Przybyszewski, Gorky, and Jelinek. He mostly writes his own scripts but usually bases them on literary classics. He is captivated by the different facets of the human soul. This was evident in his screen adaptation of Fyodor Dostoyevsky’s THE IDIOT (2011). Following in Dostoyevsky’s footsteps, Sarnet believes one must focus on that which upholds man and culture so that they do not become devalued and start placing value in the banal. Dostoevsky, whose best books are not just profound examinations of the human soul etc, but also nasty, violent, ironic, caustic, and (at times) extremely funny. Sarnet is continuing in that tradition with NOVEMBER. NOVEMBER opens theatrically in New York City on February 23rd, and in Los Angeles on March 2nd.